At a speed of 20 kilometers per hour, the fastest that his pre-1960 Lanz Bulldog tractor can reach, Wirth says that making contact with people and enjoying the views of the central European countryside are the important things in the journey. Things that a plane ride can seldom provide. As soccer fans from around the world begin to congregate in Russia ahead of the World Cup, each person experiences a unique journey. For German fan Hubert Wirth, the journey on a vintage tractor from Germany to Russia can be counted among the most unique ones. Accompanied by his trusty dog Hexe, Wirth makes headway to Moscow at his own pace, taking leisurely stops whenever he feels the need to. He even leaves himself the option of switching his mode of transportation, for some variety, with a quality bicycle attached to his trailer. Wirth plans to reach Moscow in time for Germany's first game in the tournament against Mexico on June 17. Still holding out hope of acquiring a ticket to that much-anticipated match, Wirth is only sure that he will watch the France-Denmark match in Luzhniki Stadium, and that he will connect with the people of Russia and fans from around the world. Despite the big "Hello Moscow" stamped on his vehicle, Moscow will be far from the end of Wirth's journey. He plans to drive north to St Petersburg from where he will take a ferry to Helsinki and make his way home through Denmark. Wirth is a lifelong motorhead, having worked at Daimler-Benz car manufacturer until its closure in 1998. 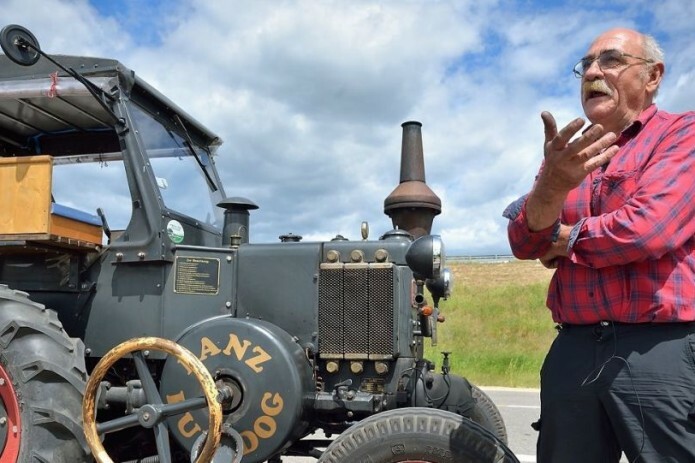 Speaking with Reuters via telephone (thus the bluetooth earpiece in the corresponding video), Wirth claimed that the Lanz Bulldog tractor is one of many vehicles he restored himself.